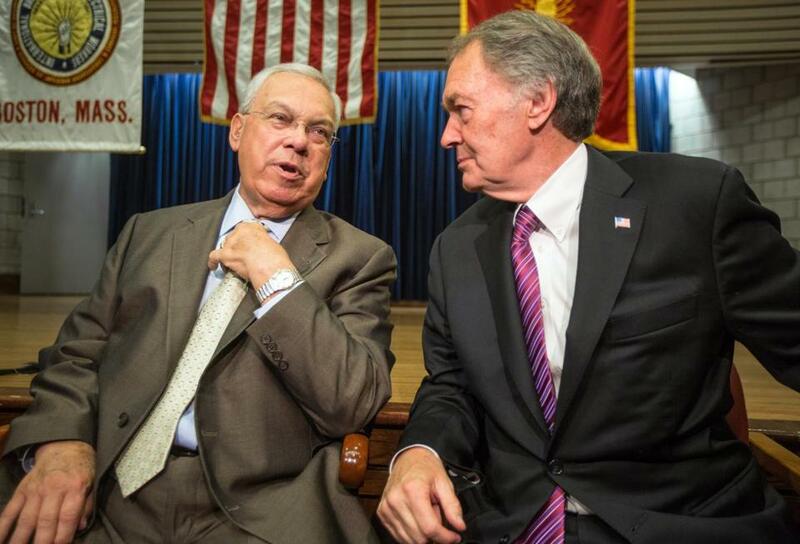 Mayor Thomas M. Menino endorsed Democrat Edward J. Markey for the US Senate Friday. Representative Edward J. Markey, the Democratic nominee for the Senate, paid an effective tax rate of less than 20 percent over the past eight years, claiming large deductions for his mortgages, his travel expenses, and his car, his tax returns show. According to his federal and state tax filings dating back to 2005, almost all of Markey’s income, which ranged from $140,777 to $161,433 per year over the eight-year period, came from his congressional salary. Markey, who turned 66 in July, also began collecting Social Security benefits last year, his 2012 tax return shows. The documents indicate he received $11,600 in Social Security benefits. Markey wrote off large payments for mortgage interest, property taxes, and business expenses, in itemized deductions that ranged from a low of $38,378 to a high of $49,066 a year. The Markey campaign said his effective tax rate was 20 percent or less over the eight-year period. However, a spokesman insisted the tax rate was largely because he fell under the so-called alternative minimum tax, and not because of the deductions. “Like many Americans, Ed paid the alternative minimum tax, which means that he did not benefit from many of the itemized deductions in his filings,” said his spokesman Mark Horan. He could not explain why the rate was as low as it was. The standard rate for someone in Markey’s tax bracket is closer to 30 percent. Markey’s campaign did not release the returns but allowed reporters to review his federal and state filings at the state Democratic Party headquarters in Boston Friday afternoon. His wife, Susan Blumenthal, a doctor and health care consultant, filed her taxes separately from Markey, as is allowed for married couples. The campaign did not release Blumenthal’s returns. Markey’s tax returns showed no stock or bond holdings. His returns did not reflect his wife’s investments. Markey’s Republican opponent, Gabriel E. Gomez, released six years worth of tax returns in March and again this week, and had criticized Markey for declining to release his filings. The effective rate for Gomez was 21 percent over a six-year period. Markey pledged to release the returns earlier this week, then postponed the review until Friday, leading some GOP critics to accuse him of burying the news by dumping the reports at the start of Memorial Day weekend. Markey’s team sought to show they were being more forthcoming than Gomez by releasing two more years of returns than Gomez had, along with all the related schedules. The returns released Friday included Markey’s 2005 federal and state tax returns, a challenge to Gomez to do the same. The Republican has refused to make those 2005 returns public, despite requests from the media. He faced tough questions after the Globe reported that he had claimed a controversial $281,500 historic preservation tax deduction that year on his Cohasset home. The address Markey used on his federal and state taxes forms was redacted. Horan could not explain why, but insisted that the congressman used the address of his Malden home. Markey has come under fire for also spending much of his time at his upscale house in Chevy Chase, Md., a Washington, D.C. suburb. Gomez released returns for the years 2007 through 2011 showing he made $10.1 million over six years as a private equity investor and paid an effective tax rate of 21 percent over that period. However, Gomez has not yet filed for 2012. Gomez also did not release schedules that would reveal more information about his deductions. Gomez’s tax returns showed itemized deductions as high as $536,379 in 2008, dwarfing the amounts that Markey claimed. In comparison to Gomez, Markey’s income was quite modest. Other than a small amount of interest on money in the Congressional Federal Credit Union, Markey’s income consists mainly of his congressional salary. Because his wife files separately, it was unclear how much Blumenthal made and what deductions she claimed, though her investments are noted on a financial disclosure document that all members of Congress and Senate candidates are required to file as a way to spotlight any potential conflicts of interest. The last filing available, for 2011, showed that Blumenthal held a stock portfolio valued between $845,000 and $2.1 million. Markey’s deductions for mortgage interest and real estate taxes on his returns include only his share of the expense — not Blumenthal’s — for properties in Malden and in Chevy Chase, Horan said. Each year, Markey’s tax returns show, he claimed large deductions for work-related expenses, including a $3,000 deduction for travel expenses. He also claimed deductions for the depreciation of his Toyota Camry hybrid, which is now about six years old, as well as for parking, tolls, and other driving expenses in and around Washington, D.C. He also claimed additional business deductions of varying amounts, only some of which were described in detail on the returns. One 2007 deduction showed a $975 expense for professional books, while in 2005, he claimed $550 for professional magazines and journals. Markey also gave about $2,200 a year to charity. “It’s consistent with what he can afford,” said Horan said of the charitable contributions. Stephanie Ebbert can be reached at ebbert@globe.com. Follow her on Twitter @stephanieebbert. Frank Phillips can be reached at phillips@globe.com.